If you are a grandma, grandpa, pastor and/or church leader - or know someone who is one of these - this post is for you! 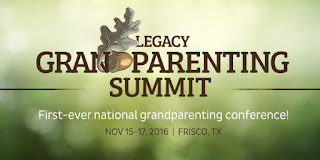 I want to let you know about an amazing opportunity you have to hear Chuck Swindoll, Josh McDowell, Tim Kimmel, Gary Chapman, John Trent, Wayne Rice, Larry Fowler and many more nationally known speakers talk about grandparenting . . . yes, grandparenting! 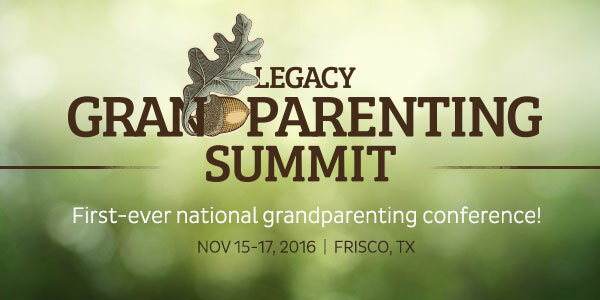 Just the opportunity to hear one or two of these speakers is something which would likely get your attention and capture your attention, but all these people, and many more, will be speaking at the first-ever National Grandparenting Summit, November 15-17, 2016. And, they are all going to be talking about grandparenting . . . something you certainly care very much about. You'll find all the details at this link - please check it out and share it with all the grandparents, pastors and church leaders you know . . . plus, if you register before June 30th, you'll save $50 on the early-bird registration! So . . . please check it out and share this with the people you know!